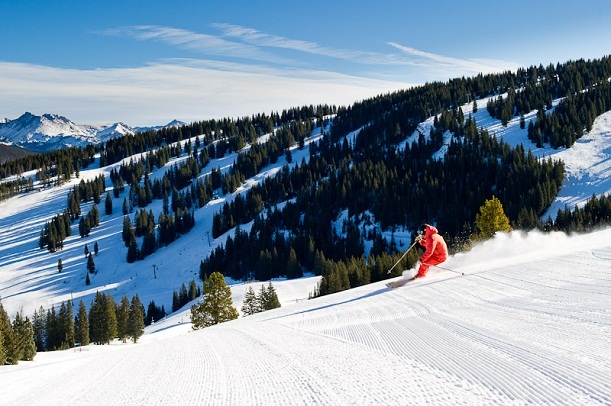 The high-speed quad out of Mid-Vail, Mountaintop Express Lift (#4), will be replaced with a Doppelmayr high-speed six-passenger chairlift for next season. 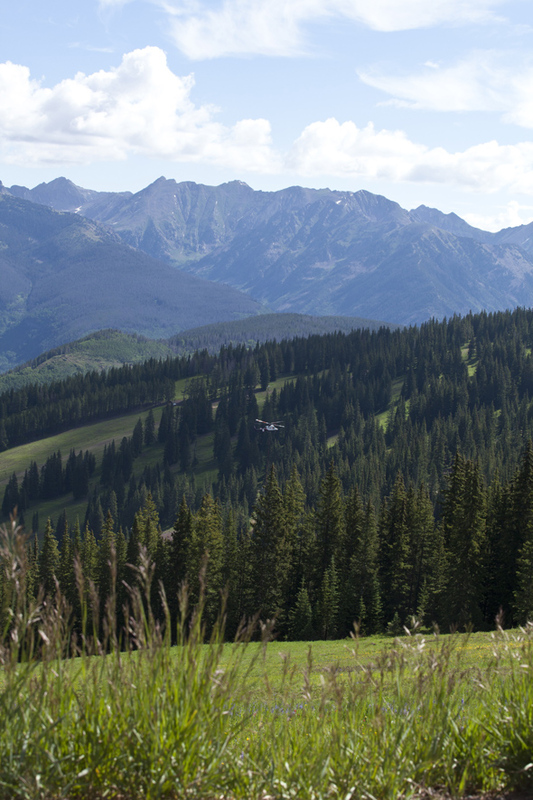 This will increase capacity by 33 percent to 3,600 people per hour – the same capacity as Vail’s new gondola, One. For photos of the progress of summer tower construction, scroll down. The existing lift was installed in 1985 and is one of the most frequently used lifts on Vail Mountain, providing access to Patrol Headquarters and a number of surrounding areas including the legendary Back Bowls and Blue Sky Basin. The new lower lift terminal will be located approximately 90 feet to the east of the existing terminal, resulting in a lift maze configuration that will decrease cross-traffic of skiers and snowboarders in the surrounding area. The upper terminal location will undergo minor adjustments to accommodate a more efficient circulation of skiers and snowboarders. The most unique feature of the new lift will be the loading gates with a right angle load and a loading conveyor system. This system, which has been widely used at European resorts for years, is shown to reduce the number of lift stops and slows, thereby increasing the efficiency of the lift. This will mark the first loading conveyor on a high-speed, six-passenger lift of its kind in North America. The Gopher Hill Lift (#12) in Golden Peak – a fixed-grip double Riblet chairlift installed in 1974 – will be replaced by the old Rose Bowl lift (#4) from Beaver Creek. 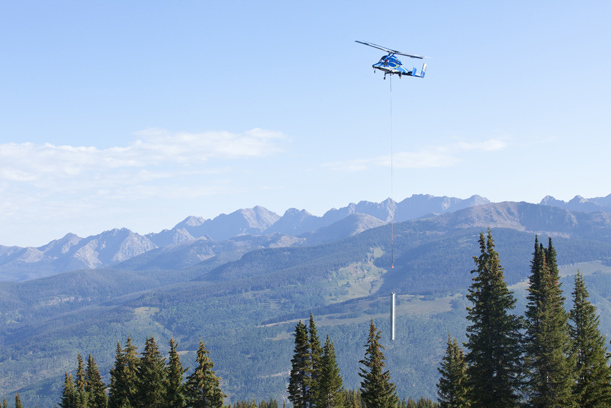 The fixed-grip triple Doppelmayr lift will increase capacity by 50 percent over the existing Gopher Hill Lift (#12), which predominantly provides access to the Golden Peak area for beginners as well as access to Vail Village. The triple lift will also allow for twice the capacity of three to six year old ski and snowboard school guests, who are required to ride the lift with an adult. The lower terminal will be adjusted slightly in both location and elevation to allow beginner guests easier access to the lift and to facilitate better use of both the west and east lift mazes. 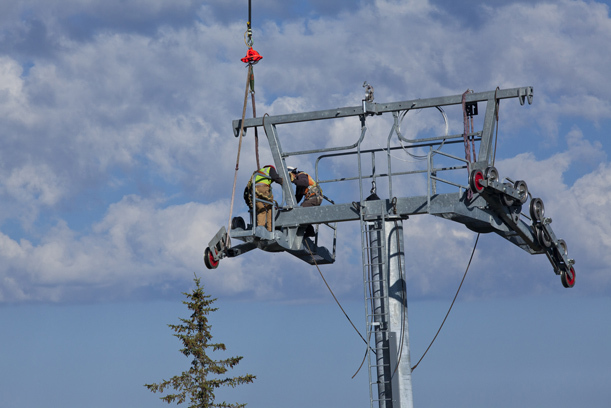 The lifts are proposed to be installed in the spring and summer of 2013 and operational the 2013-2014 ski and snowboard season. 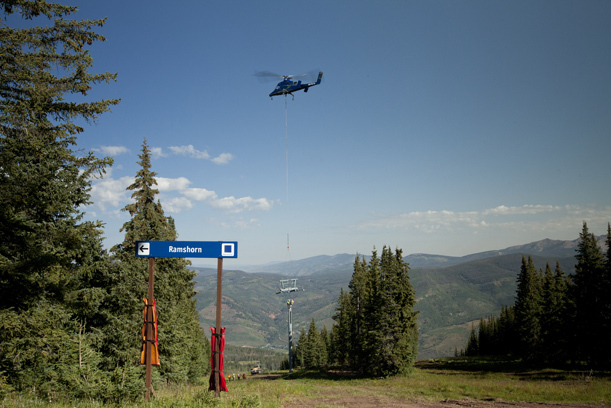 The new lifts are subject to Town of Vail and U.S. Forest Service approval. Additional details on the design and approval of the proposed lifts as well as the manufacturer of the new Mountaintop Express Lift (#4) will be available in the coming months. The K-MAX helicopter is known as an “aerial truck”. Incredibly efficient and tough, it can lift as much as a crane but uses less gas. 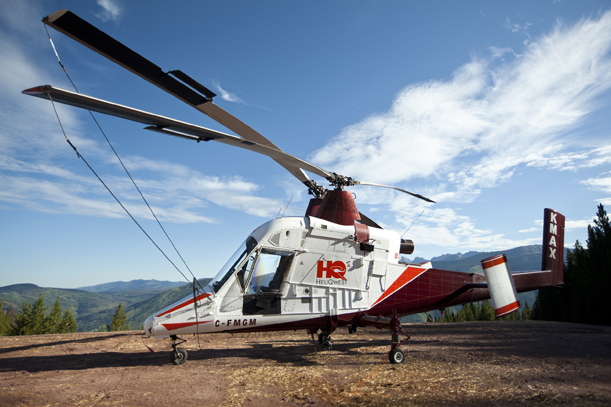 It spends the summer flying to various sites around North America to assist with ski area projects, wildfires and logging. There are only 28 still flying in the world. Pilot David O’Connor has been flying these helicopters for 25 years. 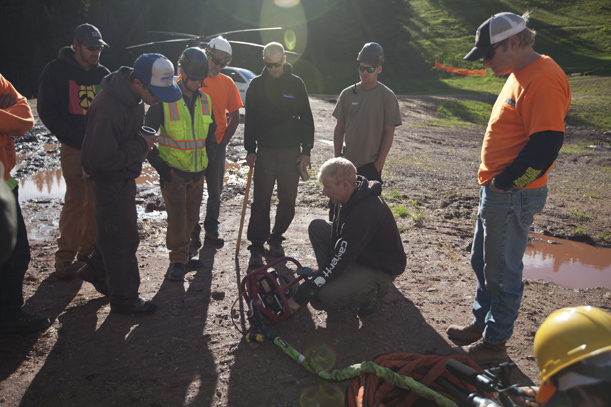 Here, he shows the crews how to use the Spectroline hook to attach the lifts to the helicopter cable. The crews catch the cable dangling from the K-MAX helicopter in order to hook it to the lift tower. 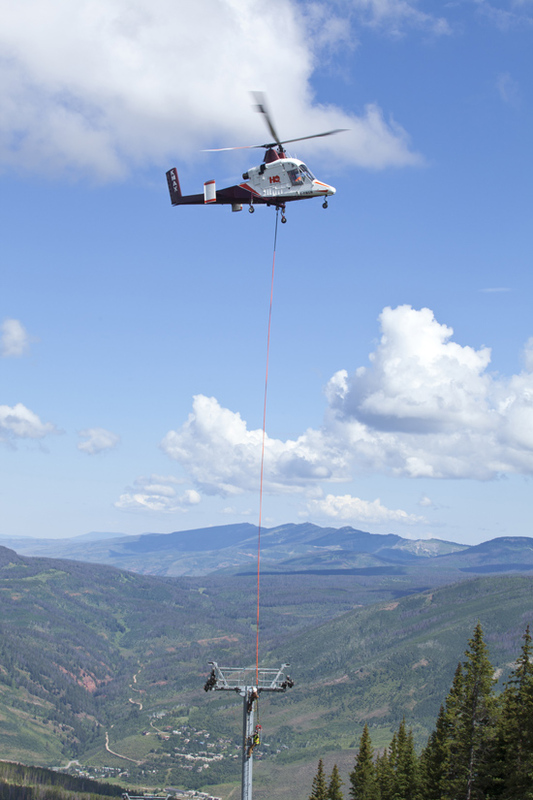 The helicopter carries a tower to a site at the base of the mountain where they can be loaded on to trucks to be delivered for use at other ski resorts. 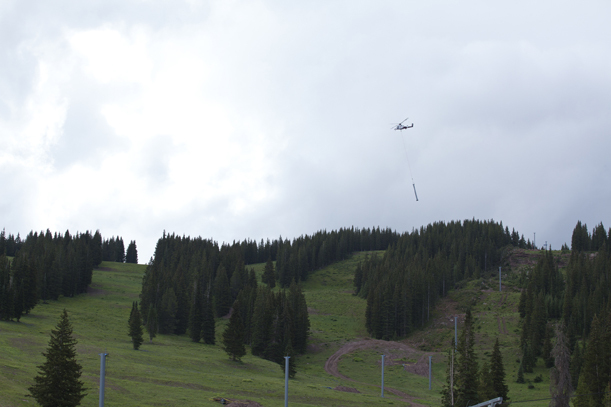 A view of the helicopter from Wildwood Restaurant on Vail Mountain.